What's not to like? A game on national television and gingerbread cookies. After a lengthy lock-out and backdoor mudslinging amongst millionaires, the NBA is back. The season kicks off on Christmas Day with five nationally televised games and one of them includes your Golden State Warriors. The Warriors will be the finale of the day with a 7:30 p.m. tip-off against the Los Angeles Clippers. You wouldn't expect the Warriors to get that spotlight, but that's where these holiday chips fell for the Oakland based team. Basketball fans who haven't already gotten their tickets still have time to do so. Warrior officials say there are still seats left, but the game is expected to sell out. 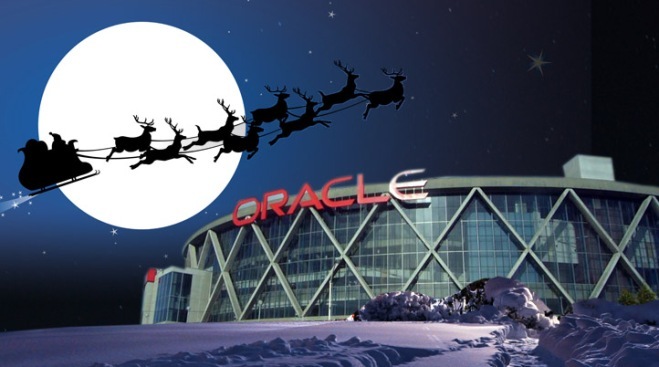 To make sure that Warrior fans don't have to miss out on any Christmas festivities to attend the game, the arena plans on bringing the holiday right to them. Before the game, fans can expect to be greeted by Santa, along with his faithful reindeer and sleigh. Fans can take pictures with Santa and his team outside the stadium before heading in to get seated. You'll also get a Santa hat of your own before you take your seat. The stadium has also arranged for an external light show around the building. To wrap everything up after the game, there will be fireworks shot from atop the stadiums roof. Warriors officials say this is the first time in years that the stadium has made such an extravagant arrangement. If all of those activities aren't enough incentive to see the game live, the Arena will be featuring a full holiday menu created by Levy Restaurant's Executive Chef Desmond Calhoun. The chef will be whipping up holiday favorites for the expected 20,000 or so who show up. The menu features gingerbread Warrior cookies (complete with frosted jerseys), and a specialty sandwich with sun-dried cherry chutney, and apple and hazelnut dressing. In addition to the usual stadium beers and sodas, fans can enjoy hot cider, eggnog, and peppermint flavored coffee, or head over to the stadiums hot chocolate bar, complete with Ghirardelli chocolate and marshmallows. If the team gets a win, it will be a Merry Christmas to all and to all a good night.